New maps, new weapons, and a new class. 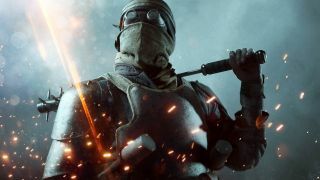 The maps, weapons and classes of the They Shall Not Pass expansion are now available to all Battlefield 1 players. To get the free stuff log in to the Origin store, search for They Shall Not Pass and click the 'add to library' button—voila! The Rupture map from this pack has been free for a couple of weeks, but now everyone can access the smouldering Verdun Heights, Fort De Vaux and the tank-heavy Soissons map. The expansion also adds the French army and the Trench Raider class, which uses grenades and a big spiky club to clear out defense networks. The next big Battlefield 1 update is due in June. Shock Operations will add a 40 vs 40 sector capture mode to Giant's Shadow, Prise de Tahure, Lukow Pass, Zeebrugge and River Somme. All owners of the base game will be able to play on those maps in Shock Operations mode. Beyond that we turn our attention to the next Battlefield game, which is rumoured to be set in World War 2 and feature a battle royale mode and randomly generated co-op missions. Guess what, Call of Duty: Black Ops 4 may also have a battle royale mode, because that is the new hotness. The news made us ask ourselves whether FPS games even need a singleplayer campaign anymore. What do you think?